W.L. 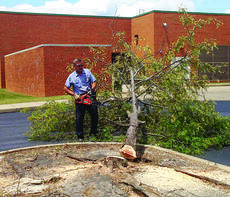 Miller, maintenance worker for LaRue County Schools, cut trees beside LaRue County High School last week to make way for new landscaping. Several Western Kentucky University students from LaRue County and surrounding communities earned degrees at the May commencement ceremonies. Several local students were named to the University of Kentucky’s Dean’s List for the spring semester. Undergraduate studies students who earn at least a 3.6 grade point average in 12 or more hours of courses with a letter grade are placed on the Dean’s List. Eastern Kentucky University has announced that 1,177 students earned President’s List honors for the Spring 2014 semester. 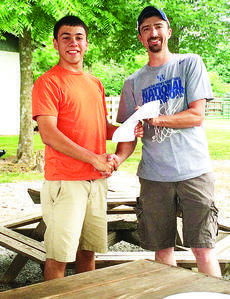 LaRue County Young Farmer President Joe Stults, right, presented Kyle DeVary with a $500 scholarship at the Young Farmer summer cookout at Hinton’s Orchard. The first day of school for students is Aug. 6. Fall break is Oct. 6-10. Summer reading will be held 10 a.m. to noon July 23 at Abraham Lincoln Elementary School for both HES and ALES students. AR points will count toward next school year and door prizes are given out every 30 minutes. Abraham Lincoln Elementary School will hold registration 10 a.m.-6 p.m. July 29. Parents may bring supplies at this time if needed. 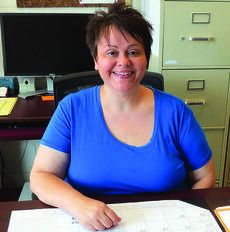 This year, Marsha Duncan, LaRue County School Districts Youth Service Center coordinator, assumes an additional role, having been chosen as chairperson of the 13-county, 18-school-district Family Resource and Youth Services Center Region 11 Advisory Council. 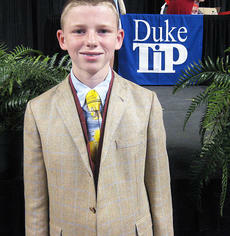 Jonathan Whelan, the home-schooled seventh-grade son of David and Beverly Whelan of Howardstown, was recognized in Duke TIP’s Kentucky Recognition Ceremony at Western Kentucky University on May 23. To be eligible to participate in Duke University’s Talent Identification Program, a student must have scored in the top 5 percent of his grade on a national standardized achievement test. Eligible students are then required to take either the ACT or SAT alongside college-bound 11th and 12th graders.